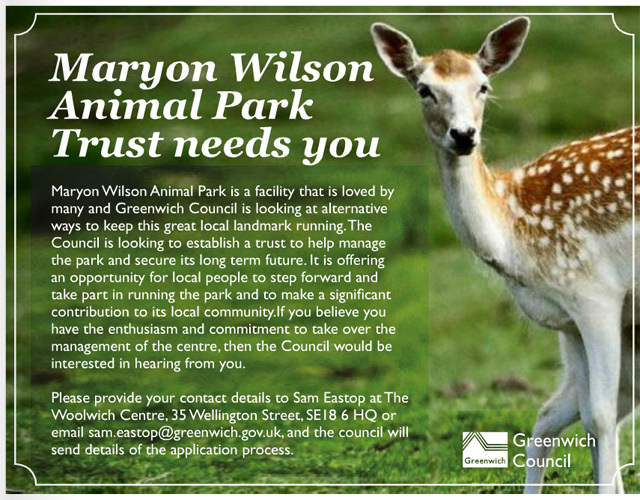 Could you help start Maryon Wilson Animal Park Trust? Setting up a trust merely gets the park off the council’s books – which was the aim of the funding cut all along. It then becomes the trust’s problem to find the £43,000 a year it costs to keep the centre open. Is anyone up for the challenge? Of course, if the council and the embroynic trust want to find a way of communicating with local people in SE7 – they know where to find us.